On visiting the mod’s website you may lower your expectations due to the size of the team, how could three people possibly create anything substantial? If you’ve never played before, start heightening those expectations now, Precursor is if nothing else, impressive. Here’s why. Firstly I should say I will draw a lot of comparisons to the Half Life games, but with the mod doing a good job of feeling like a part of one, these will be unavoidable. Set 304 days before Freeman’s insertion to City 17 (a fact handily pointed out by the opening mission text) you play as M. Romanov, a resistance fighter assigned with securing the White forest base. Joined by his Russian comrade Oleg and a woman named Elena who from the accent I am going to assume is French or Belgian, if not….. The mod opens with what can only be described as Gman’s attempt at Inception. After this brief trip through dreamland, you awake to find yourself in a City 17 apartment with civil protection heading your way with the express purpose of smacking you upside the face. You’re given a very brief introduction to the story, courtesy of a radio broadcast by Oleg, one thing to note here is that the voice acting is very well done, Oleg maintains a believable accent while still being easily understood, a feat not always performed in some mods, and Elena’s accent, though confusing, is just as understandable. You are then immediately tasked with running away from your pursuers through the streets. This introduction sets a good precedent for the rest of the mod, providing some of what the original Half Life 2 did, but in a much shorter time span. As soon as you reach the streets it’s made immediately obvious that you’re in the same City Freeman will soon fall into. 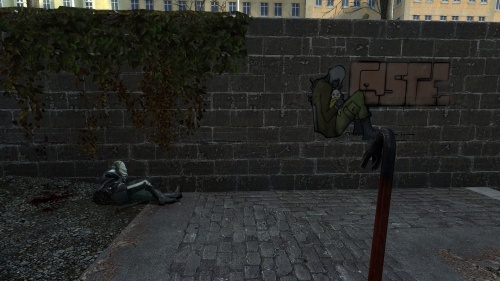 Attention being given to small details, such as the resistance graffiti littering the back alleys and lambda sprays leading you to your objective. Accidental symmetry, just one of the side effects of a crowbar to the ribcage. 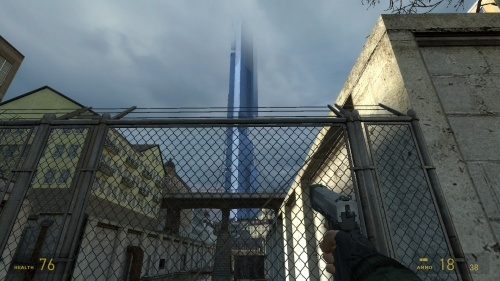 From here on out the mod plays very much like Half Life 2, fire fights split up by puzzles. These puzzles are all unique and even though they use the same basic mechanics that have been in the engine since 2004, they don’t feel redone. Using the steam from a pipe to blow up an explosive barrel, to open a passage through a wall made me smile, though one of the least difficult puzzles, it surprised me that I hadn’t seen it in the actual game. This review should not go without a mention to the set pieces, they are awesome. Riding on the back of a train while taking out three metro cops about to execute resistance members, awesome. About halfway through the mod comes the required zombie level, usually my least favorite part of any mod or Half Life game, this one is no exception. Although this time, it’s for a good reason. Your introduction to the zombies was by far the highlight of my playthrough, a brief moment (which i refuse to spoil) creates the tension Ravenholm took 10 minutes to do. 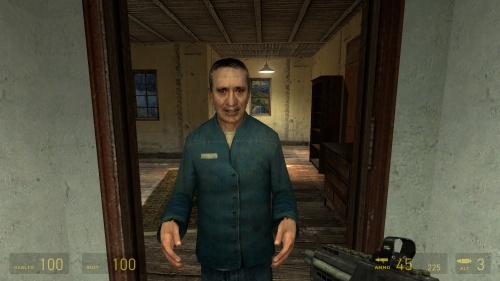 It is however in this zombie level that the difficulty of the mod will become apparent to most players, while not impossible to complete the mod is definitely harder than the games it is based off of, while this isn’t necessarily a bad thing, it adds weight to the teams recommendation that you should play episode 1 and 2 before attempting your playthrough. One gauntlet event in particular towards the end of this segment can throw you off if you aren’t prepared. Oh and before i forget, being a resistance member you are given a realistic load out; no RPG, no Zero-Point-Energy field manipulator, no pherapod. Just you, a few guns and not a whole lot of bullets. Imagine Ravenholm without the trusty, grav-gun sawblade combo. Not too bad? Now imagine it without the flashlight. Sweet dreams. Every time the mod feels as if it is about to hit a low point and turn into a mindless corridor shooter, it brings back a tried and tested element from the games and reuses it in a new way. In Half Life 2 hopper mines didn’t feel like mines, they felt like sentient explosive barrels. Without the grav-gun they prove their worth to the combine, you have to treat them as mines. They only have one brief appearance, but that again works in their favour. And now onto the problems i had with the mod that actually hold weight on the review (some things didn’t make sense in context to the Half Life canon). Very close to the end of the mod is a, “boss battle,” for me at least, it simply wasn’t very fun, thankfully once i figured out the secret it wasn’t too long either but for the few minutes i spent wasting ammo, which wasn’t too readily available, i was disappointed. Up until this point the mod was mostly enjoyable with most low points being due to my own inadequacy. Another problem related to this battle is a small section where you have to run away from the boss at the very end of the mod. There are a few small issues related to the pathing, the thing chasing you will sometimes get stuck on objects in its way, it makes what should be an action packed ending far too easy. Earlier in the review i mentioned the puzzles, while these are all good and none are impossible, one in particular frustrated me. During an underground section you have to navigate across a floor of electrified water. Though the size of this floor is very small, navigating it can prove troublesome. The solution is to use some wooden pallets to create a makeshift bridge across the water, this would be fine, if it weren’t for pallets being some of the least reliable props to stand on. They tend to move underneath you as you move, which can make jumping onto the next one more difficult than it has to be. This however is not the fault of team Precursor but of the engine, it could however be avoided by using or creating a more reliable prop. And that’s it; I had no other problems with the mod that warranted recognition, the mod was tested thoroughly by a huge number of people, had this mod been created by a much larger number of people i would still be amazed by the detail, tension and overall enjoyment gained from playing through it. The fact that three people could create something like this says very good things for the mod community. If you own Half Life 2: Episode 2, there is no reason why you shouldn’t download this.